One of the great virtuosos of our time, François Rabbath was born in Aleppo, Syria. After moving to Paris, where he currently resides, he worked with performers such as Jacques Brel, Charles Azanavour and Michel Legrand. During this period he developed his own special blend of Middle Eastern, Indian, African and classical European styles. Both his playing - which can only be described as a combination of astounding virtuosity and sensuous expressiveness - and composing reflect these influences. Through his legendary early recordings, he became renowned first in France and eventually worldwide. 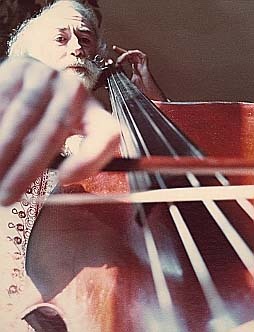 His three volume method book - A New Technique for the Double Bass has gained broad acceptance and is in wide use throughout North America, Europe and Asia. Prades, dedicated to the memory of Pablo Casals, is one of a trilogy of short pieces written in memory of three revolutionary Pablos - the others being Neruda and Picasso. Casals left Franco's Spain in 1936 and settled in Prades, a Catalan village on the French side of the Spanish border. In 1950 it became the site of the first Casals Festival.